A rich resource for preaching, study, writing, or pure enjoyment. 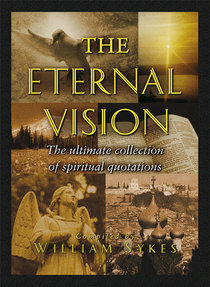 The Eternal Vision is a book for all seasons comprising thousands of quotes. Biblical, literary, witty, moving, memorable, and eminently quotable, this collection will have many uses.^A rich resource for preaching, study, writing, or pure enjoyment, THE ETERNAL VISION is a book for all seasons comprising thousands of quotes. Biblical, literary, witty, moving, memorable, and eminently quotable, this collection will have many uses. - Publisher Thousands of quotes to make your sermons more memorable, your conversation wittier, and your days brighter! Developed by the chaplain of University College at Oxford, this splendid collection features biblical, literary, funny, moving, and memorable quotes on 120 themes---plus a CD-ROM to make finding, cutting, pasting, and appropriating the right words easier. Thousands of quotes to make your sermons more memorable, your conversation wittier, and your days brighter! Developed by the chaplain of University College at Oxford, this splendid collection features biblical, literary, funny, moving, and memorable quotes on 120 themes---plus a CD-ROM to make finding, cutting, pasting, and appropriating the right words easier.